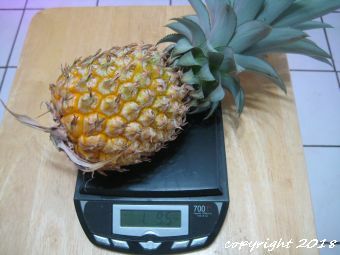 Plants are easily grown from the leafy tops of pineapple fruits. See details. Pineapples are slow growers and prefer a light, constant feeding. See details. Although pineapples can withstand drought, they prefer moist, acidic, loamy soil to grow well. See details. It generally takes 2 years for a plant to reach flowering size. See details. Fruit was harvested on August 7, 2018. The sugar/acid ratio was perfectly balanced.